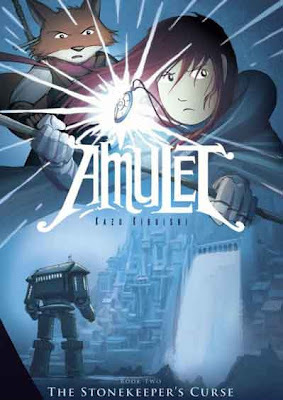 After reading the first installment of the series, I knew that kids would devour AMULET. I was right. I no more than introduced the book to elementary students that they began asking when the next one was due out. They were hooked. Who wouldn’t be? The story is strong and exciting, scary and inviting, and an all around good book for boys and girls. In my first review, I stated that AMULET was a keeper and I still feel that holds true. The second in the series continues the pace and intensity, and continues to develop the characters. I am especially happy to see more time being spent on Navin and his maturity. Slowly but surely these children are turning into heroes. The fantasy story with dollops of science fiction is a nice blend, and the female protagonist is nicely complimented with the strong mentor of Leon the fox-guide and Emily’s hero-to-be younger brother. AMULETE BOOK 2: THE STONEKEEPER’S CURSE is a astonishingly complex and intense storyline for children, one that I have no trouble getting kids to read and fall in love with. I’m ready for the next book and volume two has not yet hit shelves. I know the kids will clamor for more once they read this installment. The overarching theme of control is aptly written with the amulet itself as a metaphor for our base human instincts. In book two, Emily is in a constant struggle to suppress the power-hungry amulet, which is trying to persuade her to give in to the power and let it roll through her. Teachers with a flair for geekness, should guide students to create a text-to-text (text-to-film) connection with Star Wars and the push for the Skywalker boys (Anakin first and Luke later) to give in to the dark side of the force. We can later connect those feelings to ethical dilemmas and the choice to do right in spite of our feelings of anxiety, anger or pain. The concerns are the same as in the first book: magic, monsters and swordplay.